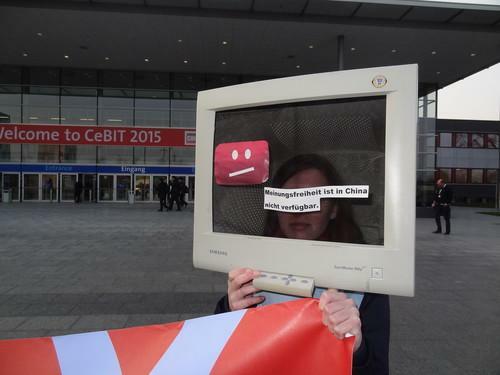 A protestor disguised as a computer at the entrance to Cebit 2015 displays an error message: "In China, freedom of speech is not available." Jack Ma, founder of Alibaba Group, made his first visit to the Cebit trade show 14 years ago, pitching Chinese products to Westerners from a small booth that attracted few visitors. Eight years ago, he returned, that time hoping to interest European companies in an online marketplace. That didn't work out, because people saw the Internet and trade fairs as competitors. Now, though, Ma has it made. China's tech industry, of which his company is one of the leaders, is a guest of honor at this year's show, and Ma was the industry star of Sunday night's Cebit opening ceremony, where he told the story of his previous visits. Feted during the opening ceremony, Ma would have been jeered on Monday morning had he been among the first through the gates. Two groups of protestors greeted visitors, one from Amnesty International, the other from Germany's Society for Threatened Peoples. Both were unhappy about how the Chinese government orders companies to censor the Internet. On one banner, a caricature of German Federal Chancellor Angela Merkel floating on a magic carpet asked: "Jack, how about Internet freedom in China?" "Let's talk about something positive instead," the caricature of Ma replied. On another, a computer error message reported: "In China, freedom of speech is not available." Merkel and China's Vice Premier, Ma Kai, danced around the topic of government control of communications at Sunday's opening ceremony, with Ma alluding to "guaranteeing information security" and Merkel calling for "equal treatment of our companies and countries" in negotiations. For his part, Ma is used to making enemies. Online marketplaces such as Alibaba have overturned age-old business practices: "Lots of companies hate the Internet because it destroyed their business," he said. But the Internet revolution will continue: After changing wholesale (business-to-business) and retail (business-to-consumer) sales, the next wave of Internet change will be consumer to business, and manufacturers must learn to customize their products to suit customer tastes, he said. "Manufacturers must use machines that not only produce products but that think," he said. "Those machines are not going to be supported by oil but by data. Businesses will not focus on power or on size, but on flexibility." Ma should be pleased by the presence of a sprinkling of 3D printer manufacturers at this year's Cebit, including Formlabs, a specialist in high-resolution printing of small objects, and be3D, whose giant machine can print objects over one cubic meter. While those are so-called "additive technologies," a service in Hall 16 called Robo-Chop is producing custom sculptures with a robot arm that cuts away high-density foam using a hot wire. The robot's minders expect to produce 2,000 pieces, each about the size of a small stool, during the show, all designed on a Web app. Buying works of art like that over the Web can still be a laborious process, but Ma used his opening speech to showcase a way in which his company's online payment subsidiary, Alipay, hopes to simplify things using face recognition rather than a password or fingerprint to authorize payments. Unlike fingerprint recognition, face recognition requires no special hardware: Most smartphones already have the necessary front camera. Ma just had to look at his phone to confirm the purchase of a souvenir postage stamp from Hanover as a gift for the town's lord mayor. "In six days this stamp will be delivered to the mayor's office," he said. Alibaba isn't the only Chinese company at the show, of course. Alongside telecommunications industry giants Huawei Technologies and ZTE in the Chinese national pavilion, it is merely among the most visible. Nearby are TCL, exhibiting a 110-inch, curved-screen 4K TV and the somewhat smaller Alcatel Onetouch smartphones it also manufacturers, and InSpur, a server manufacturer which boasts it supplies the majority of servers used by Alibaba and by Chinese search engine Baidu in their data centers. Plenty of others are trying their luck, as Ma did 14 years ago: A glance at the show catalog under "Ch", "Sh" or "Zh" reveals dozens of Chinese companies selling cables, capacitors and chips in the far-flung Hall 13, devoted to networking and communications, and the backwater "Global Sourcing Area" in Halls 15 through 17.